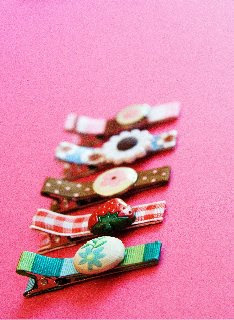 Cute Affordable Hair Clips Plus Free Shipping! I just wanted to spread the word about this mommy boutique called Oopsie Dazie that I came across on Notes From My Nest. This shop offers handcrafted hair accessories at the most reasonable prices I've ever found online. As you can see from the photo, their items are adorable too. Throw in free shipping to the U.S. and Canada and you've got yourself an amazing deal! In addition to hair clips, Oopsie Dazie also offers hair bows, head bands and wraps, ponytail holders, and decorated bobby pins. Some of my favortie items are the personalized bobbies, which are custom made with up to 5 letters and the clip caddies, which are handy wallets made especially for holding and organizing your child's hair clips.